Yesterdays story about Mozart's black lace bra is one of the more amusing results of what happens when a an artist doesn't have contractual approval over the graphics on his recordings. But things can go even more badly wrong when the artist does have control over the graphics. Herbert von Karajan led the way in the 1960s for all sorts of approvals to be written into artist's contracts, including album designs. 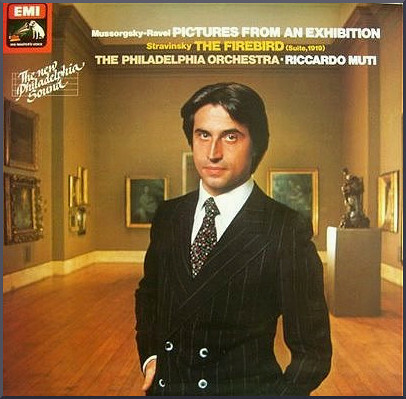 Many young pretenders used Karajan as a role-model in the 1970's classical recording boom, and one of those was Riccardo Muti. When Riccardo recorded the Mussorgsky/Ravel Pictures From An Exhibition in 1978 I was responsible for album covers at EMI, and the conductor had contractual approval over cover designs. Trying to get Muti to approve an album cover was rather like asking Attila the Hun to release prisoners. I still carry the scars of the approval process, but we finally shipped the album with the cover above, which was photographed in Philadelphia's Museum of Art if I remember correctly. The design sunk without trace when the LP was transferred to CD. But the recording, which was produced by Christopher Bishop, is still a budget-priced best-seller for the simple reason that it is very good. If I ever start to think that there is no justice in the world I simply remind myself of those jet-set maestros. Several decades ago they agonised over their likenesses on album covers. Today they are scrabbling around trying to land zero-royalty recording contracts which contain very few approvals. Read more on Muti, me, and Philadelphia here. Thanks for mentioning that particular album cover. I have the first CD issue of the album and it features, I'm pleased to say, the original LP image with Señor Muti looking very dapper. I think it's a pity that his elegance went missing with the newer, and very much whiter, graphics of the reissue. Apart from the general refinement of the original cover image, this album also contains probably my favourite version of the Pictures (talk about power!). I'm commenting here, not necessarily to let you know that I have a CD (I think approximately one person on the entire planet would be interested in knowing that - i.e., me), but to thoroughly recommend the performances to anyone who hasn't heard them. If you haven't heard this particular recording of the Pictures/Firebird yet, please do so immediately. As Art Linkletter used to say: "I heartily endorse this product." Peter, thanks for filling us in on the fact that the original graphics at least made it onto the original CD transfer. The problem is that the LP sleeve was 12 inches square and a CD jewel box is 5 1/2 square. What worked on the big canvas just doesn't work when reduced to the smaller size. Hence the shift from the album sleeve as an art form to the CD cover as a packaging exercise.